C looks like the winner to me! Okay, so I'm happy to award this contest to you now. Using C here for Earth, and your second set of symbols for water and arcane. If you could compose them all into one listing? Also, if the final format could be all of them in .pdf format, and hi-resolution .jpg and one with them all together (colour, and black and white separately), then that would be the final delivery. So that would be a total of... 16 files, I think. I hope that's acceptable to do? Hi! Thank you very much for awarding me! - One .jpg containing all of them in color. I think with this one I may set the background to be black so that the Air symbol which is white will be visible? So that would be 16 files in total. 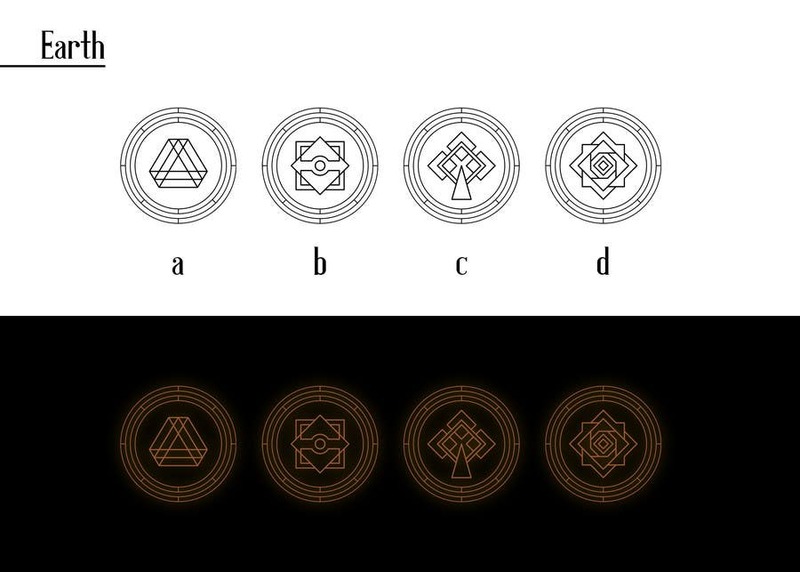 Would you like to have these symbols in .png format? In.png format they will be laid on a transparent background so that you can easily and quickly put them anywhere (and not afraid of the Air symbol to be unable to see on white background)? If you would like that, I would send you them in .png format too.